NASA astronauts Scott Kelly and Tim Kopra ended their spacewalk at 11:01 a.m. EST with the repressurization of the U.S. Quest airlock after accomplishing all objectives. They released brake handles on crew equipment carts on either side of the space station’s mobile transporter rail car so it could be latched in place ahead of Wednesday’s docking of a Russian cargo resupply spacecraft. The ISS Progress 62 resupply mission launched at 3:44 a.m. EST this morning (2:44 p.m. Baikonur time) from the Baikonur Cosmodrome in Kazakhstan. After quickly completing their primary objective for the spacewalk, Kelly and Kopra tackled several get-ahead tasks. 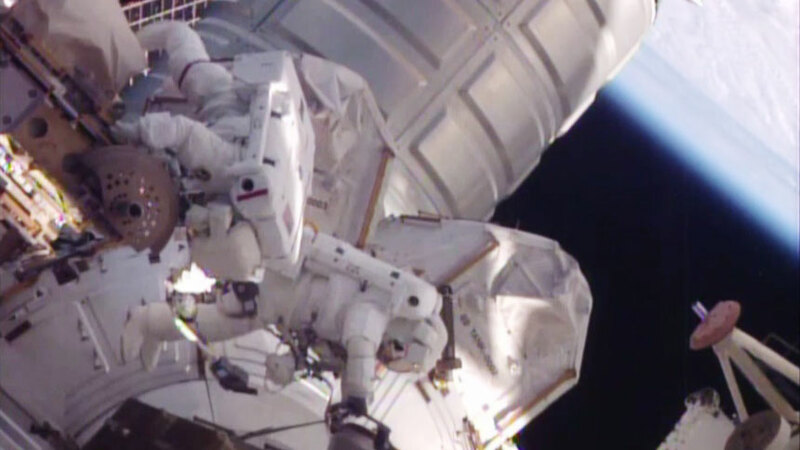 Kelly routed a second pair of cables in preparation for International Docking Adapter installment work to support U.S. commercial crew vehicles, continuing work he began during a November spacewalk. Kopra routed an Ethernet cable that ultimately will connect to a Russian laboratory module. They also retrieved tools that had been in a toolbox on the outside of the station, so they can be used for future work. The three-hour and 16-minute spacewalk was the third for Kelly, who is nine months into a yearlong mission and the second for Kopra, who arrived to the station Dec. 15. It was the 191st in support of assembly and maintenance of the orbiting laboratory. Crew members have now spent a total of 1,195 hours and 20 minutes working outside the orbital laboratory. Stay up-to-date on the latest ISS news at: www.nasa.gov/station. Congratulations on double good news!! Great job as always. Fun to watch them on NASA-TV. So pleased all went well. I enjoyed seeing the live footage. Glad to know you will get your Christmas dinner delivered now!! Congratulations for the successful space walk! So glad all went well with the walk. Just stunning!